I found these ruins in Leeds Castle and I thought they were so romantic...I had to share this picture with you. Hi Rose, You have done it again. What a Great Photograph. 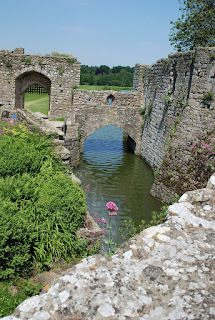 Often Wondered why It is called Leeds Castle. When Leeds is in Yorkshire. So wonderful- I think poetry has been written about it... lovely. Very romantic and the weather looks just as nice. Are you allowed to picnic there? And, I'm glad you did share! Such a beautiful scene - and, indeed, very romantic. Thanks for sharing this romantic moment! This is very beautiful - I like the progression of arches. But I wouldn't want to be caught on the business end of that pointy metal gate! How beautiful and tranquil. Just looking at this photo I can almost breathe better.